We are happy to share strategy and words of wisdom from Annapurna Garg ( Rank 68) . Friends, you know her as one of the regular writers of TLP. She featured regularly in our top TLP writers. This infact motivated us to treat her as some one in iasbaba family close to us that we called her during mains for answer writing. “Please find the attachment – it’s the article that you had asked for with a special emphasis On answer writing. On this note we sign off and share the strategy. The path that I chose three years back has finally reached its destination. The road was bumpy and nauseatic at times, but it was equally gratifying and fulfilling at the end of the day. All the note making, reading The Hindu line to line, NCERTs, test series, scribbling on walls, social isolation, listening ‘Lakshya toh Har haal me paana hai’ and ‘aashayein’ have finally born very sweet fruits. Keep your sources very limited. The more books you try to read, the less you actually absorb. So much of material in market attracts, but you have to resist. Stick to the basic books. It’s important to read those basic books again and again. I used to underline in the books itself and did not make any exclusive notes, for prelims examination. I personally feel that writing what is there in book already is a sheer waste of time. Invest that time in revision instead. But make very short and concise notes of the current affairs (especially factual ones). I used to make soft notes so that these could always be updated. While studying, one knows one’s strengths and weaknesses. It’s important to strengthen the strengths and identify and accept the weaknesses. For example, if you come across a question on zonal council, and you realise that your knowledge about zonal councils is lacking somewhere, go back to the book and read it again. And very importantly, write ‘Zonal council’ in a check list of things to revise. This ensures that you build upon your weak areas in a very organised fashion. Newspaper reading for CSE is an art. Any news has to be read with a 360 degree view of it. For example while reading a news on Uttarakhand president’s rule, try to mentally go through what, why, how, when of the topic. Any voids in the understanding should be filled by going back to the chapter and re reading it. The same strategy applies to mains as well. While reading any news, a mental analysis of the topic is important – both plus and minus of the issue at hand. Thus, things have to be done in a highly holistic manner. This strengthens the memory because well connected ideas are more likely to come to you in a streamlined flow. I failed in 2014 attempt because of my reluctance in practising answer writing. There is a psychological concept of conditioning. If we avoid something anxiety provoking, anxiety reduces and we feel good. Thus avoidance becomes a conditioned response and hence a habit. This happened with me in 2014 attempt. Thus, its very important to know one’s inner self and then devise the strategy accordingly. Self deception leads to failures. I realised this mistake of mine in this attempt and started writing 2-3 answers daily on IASBABA without fail. This made my answers better and better every day. Read the question very carefully and stick to what the question is asking. Be very specific in answering. This is because we sometimes have so much knowledge on a topic that we tend to stretch things beyond the requirement. This doesn’t fetch more marks, but only eats up the precious time. Think about an answer taking a 360 degree view of the issue at hand – political, economic, social, cultural, environmental, etc. This gives a good breadth to the answer. I wrote most of my answers in a particular format: firstly a very brief introduction, then the actual content in point format, and lastly a suitable conclusion. Conclusion should be in a positive tone and have some suggestive content. This ensures that you are making your impression on the examiner as a person who is optimistic and believes that things can improve for good. There is a common doubt whether to write answer in point format or paragraph format. Though no style can be the only best way, but I personally preferred point format. This is due to the fact that writing answer in point format covers various dimensions of the topic in less number of words. Also such an answer has more visibility and hence makes the work of examiner easy. Underlining the important aspects in the answer has its own value. It highlights the crucial matter, makes answer good to read, and hence eases the job of examiner. However, make sure that only the very important words or group of words are underlined. I underlined with the same pen to save time. Adhering to the time limit is very very important. Now GS papers have 20 questions, which boils down to around 9 minutes for each answer. Try doing it in 8 or 8.5 minutes. This ensures that all questions are attempted and still time is there for a bit of revision. This can be achieved by practising using a stopwatch. Try attempting ALL questions. Even if you have scant idea about an answer, write something about it. This may fetch you 1 or 2 marks which may matter a lot in deciding your rank. Relating an answer to the current events is a good idea. Even if not explicitly asked in the question, mention may be made of the related current government scheme or initiatives. For example, on a question of climate change, a mention of Paris summit and solar alliance would be good. Usage of good examples in the answers reflects good understanding. For example, in an answer on women empowerment, a mention may be made of sage Gargi of ancient India. This also reflects that the candidate is well read. Keeping a good motivational quote as the wallpaper on my gadgets (I pad and phone). I used to change it every few days. Feel good factor about self – a mental imagery of one’s own achievements in life helps one to cultivate a positive self image and gives a positive attitude. This is one factor that can help you stand apart from others. Belief in God gave me an internal strength and hope that good days will definitely come. This operates purely at psychological level and works as a magic potion, especially in times of distress. So don’t lose faith. Feedback from IASBABA on TLP answers was also a force. When I got that prize of TLP winner, it motivated me to work more to continue this performance. If some 1100 people can do it, I CAN ALSO DO IT. Keep “I” at a very high place. Don’t let the noise of other people opinions drag you down. 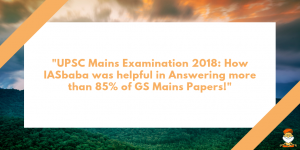 Mohd Nooh Siddiqui AIR 326, UPSC CSE 2017, part of IASbaba’s Team shares his Preparation Strategy – His mistakes and learnings in the UPSC journey!